Bosco Sodi creates art that circulates in the spheres where nature and man merge, creating beauty beneath demise. His works are influenced by a wide spectrum of artists that include Rothko, Kandinsky, Malevich, but he especially admires Tapies for his ability to impart a human sense and spirituality to his works through their material properties. 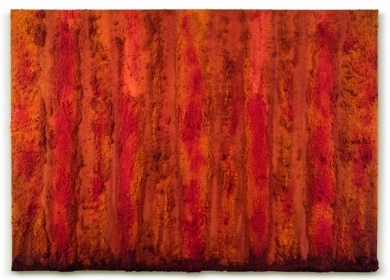 Sodi's works succeed in achieving a heightened sense of spirituality through the transcendence of their materiality. Even though the gallery is not representing the artist anymore we still have a few works in high quality in the backroom !